Hypnotic Appreciation Society: Hypnotism Noir: Beautiful Inductions: Derren Brown on "The Gathering"
Beautiful Inductions: Derren Brown on "The Gathering"
British Mentalist Derren Brown is the hypnotist who is not really hypnotizing you; he's only talking to you on a level that you can understand. 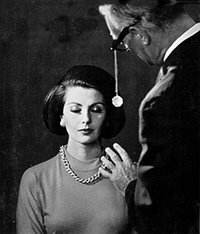 Like The Amazing Kreskin before him, Brown -who is one of the most amazing performers working right now in the world of magic- uses suggestion and NLP but very rarely does a proper, formal hypnotic induction were he puts his subject to sleep. However, his TV special "The Gathering" includes a few of these rare ocassions. The ten minute video you are about to see includes two brief sections were an English male celebrity and a female member of the audience are put under quick and fast with just a click of his fingers. After this, all the audience is invited to participate in a collective suggestion experiment where they are told to forget the entire evening. Although Charlie, the female subject, is quite lovely and seems a nice girl, the induction is unfortunately so fast and brief and the trance so shallow that it hardly enters our Beautiful Inductions chapter. However, what is interesting here is the mood. Derren Brown knows how to create an atmosphere and the lights on stage, the scenery... everything contributes to create a setting of mystery and fascination which is lacking sadly in most modern hypnosis stage shows. A tip for the average stage hypnotist doing the circuit: taking care of the dramatic and scenic aspects of your show is hardly going to hurt you guys, and it makes it more inspiring than just watching the standard row of chairs. "The Gathering" was also exquisitely shot and photographed, which also helps to enjoy it more. Also later on he performed a group hypnosis on the entire audience to make them forget the show. Frustratingly, no-one thought to put the camera on Sarah Alexander. And keep it there. I love what Derren Brown does. I use a lot of his stuff on my blog too. Why Hogan scarpe Are Favorites Among Consumers? Hogan scarpe donna has a lot of experience in creating Hogan scarpe uomo for running sports- such as track. Even still, hogan donna caters to many sports such as motor sports, sailing, football, golf, and others.